In October 2016 I did a presentation at the NACIS cartography conference in Colorado Springs, the subject was my recent typographic map of Amsterdam that I’ve produced and published myself. For this particular presentation I decided to do things a bit differently and structure my it along some song lyrics and titles. So because the slides are not really useful without my actual talk I decided to write it out and explain things a bit more. This is not a transcript of my presentation, but it should match it pretty closely. I’ve been running my business, Red Geographics, for a little over 12 years now, I mainly focus on producing maps, wrangling geographic data, selling and supporting software products for that market and helping my clients develop efficient workflows with those software products. The bulk of my hours are spent on the data/GIS side of things, which is a lot of fun to do but it doesn’t really result in anything cool that I can show to people outside the industry, so in order to remain creatively active and come up with enough “pretty pictures” I try and do a number of map production projects as well. However, these are usually for specific customers who have requirements as to the content and the style of the map, sometimes I get a lot of artistic freedom, sometimes none, but there’s always a customer who has the ultimate say about the content of the map. About as long as I’ve been running Red Geographics I’ve been attending these NACIS conferences and I’ve always been very inspired by the stuff I see here. To name a few people, out of many, I would like to recognize Daniel Huffman, Caroline Rose and Tom Patterson for their awe-inspiring contributions. So for a couple of years I’ve had the feeling I wanted to do something like that too. For the past few years I’ve been trying to reserve half a day per week for what I call ‘carto playtime’. That’s where I do stuff that isn’t immediately profitable but it does benefit me in the long run. Stuff like trying out a new technique, running through a tutorial, looking at a new dataset or new piece of software. It’s not always possible to actually spend half a day in a given week on this, what with other projects and obligations, but I do try and keep enough room in my schedule for this, as I think it’s important to grow as a cartographer. 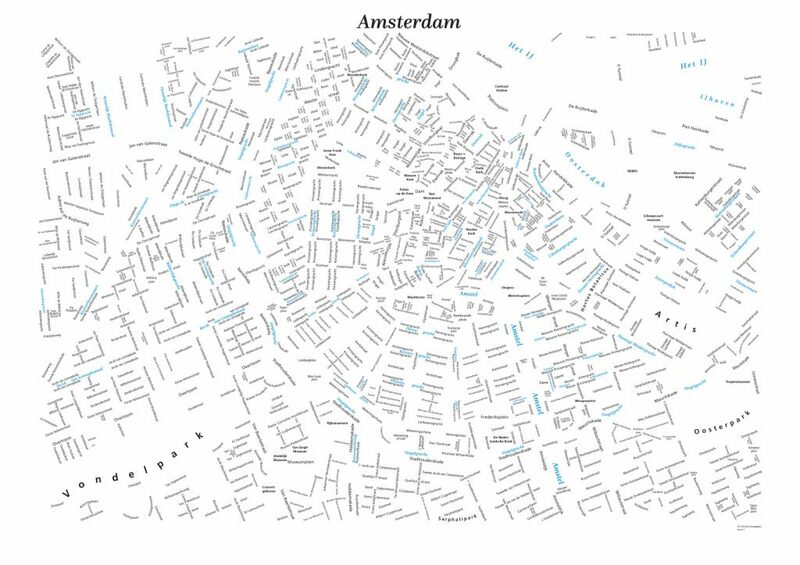 So I decided to devote some of my carto playtime for a few months and produce a typographic map of Amsterdam. The first thing to get used on this project was the unprecedented amount of freedom I had! Normally a client has the ultimate say, but this time that was me. I did discuss my ideas with some other people, got some advice, took some of it, ignored other parts of it, it’s my map after all… My primary goal was to make something I enjoyed, both as a final product and as a process. I did make one decision with a partly commercial thought in mind: the selection of Amsterdam. Personally I would have preferred to do my birthplace, Breda, but I figured more people would be interested in buying such a map if it’d feature Amsterdam. On top of that, the urban landscape of Amsterdam, with its concentric rings of canals is more recognizable than Breda. I may still do Breda in the future though. The problem with Amsterdam, however, is that I’m not very familiar with it myself. However, reference maps and data are readily available. First step was to determine the coverage of the map along with the size and thus the scale (and text size!). 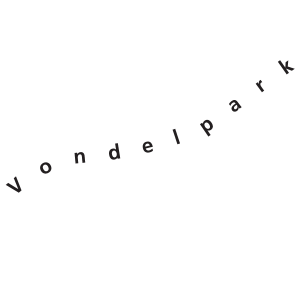 I wanted to anchor it in the southwest on the Vondelpark, a large park. I figured it’d give me an excuse to put a nicely curved label in there. After some trial and error I kept the northeast corner a little bit closer to the heart of the city. I didn’t apply the famous rule of thirds for the layout but checking it now reveals that the Dam Square is actually on the top horizontal line of that grid, purely coincidential I assure you. I started out by importing some Dutch Cadastre data to get the basic layout of the city right, then started labelling the major roads, the canals and a few important locations and parks. I kept the reference layer visible throughout most of the production phase to maintain some geographic coherence. 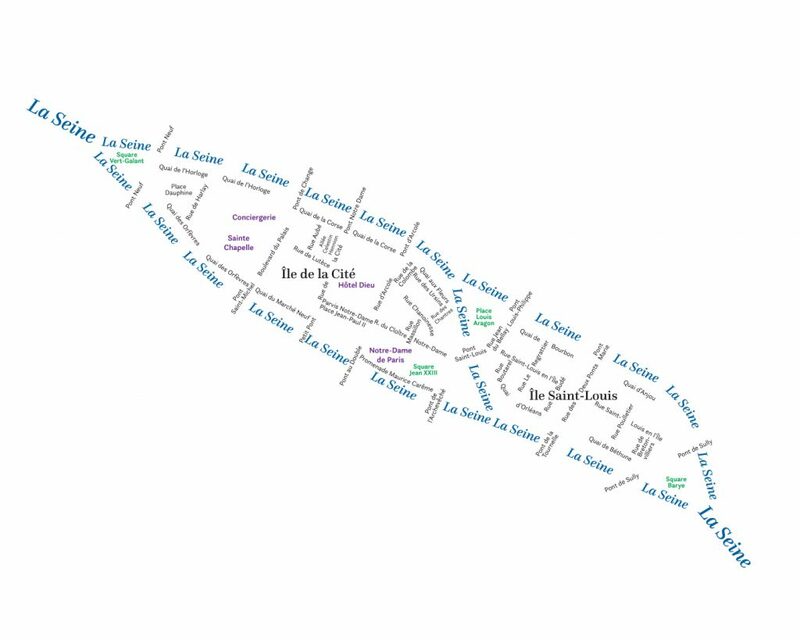 After setting up the major roads I dove in to the smaller streets, tackling neighborhood by neighborhood. This was the most difficult part of the project, for a large part due to the Dutch tendency of assigning really long names to rather short streets, especially the medieval city center took a lot of work, but also some of the 17th century expansions (the Jordaan neighborhood) were difficult as there was a tendency of naming the streets along both sides of a canal the same as the canal, then carry that name on to the cross streets and number those. For example on either side of the Egelantiersgracht canal you have an Egelantiersgracht street. 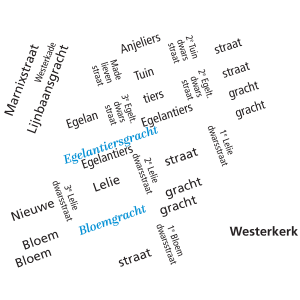 That has 3 cross streets, the 1st, 2nd and 3rd Egelantiersdwarsstraat and then those in turn intersect the Egelantiersstraat which parallels the canal. However, and I have to admit I was quite slow in realizing this, the fact I was only going to show texts actually gave me a bit of geographic freedom. If I needed to move some labels around a bit to create more room for others nobody was going to notice that the geography wasn’t completely correct anymore. Even as a cartographer that was something I needed to get used to. So I soldiered on through the entire map, the odd hour here and there when I could spare it and eventually got “version 1” more or less finished after about 3-4 months. I didn’t count my hours, maybe I should have, but a rough estimate is 40 to 60. And considering that a map of this complexity is never finished there’s been quite some minor tweaks here and there ever since. The next step of the project was to turn this into a real product and start selling it. This meant I had to reach out and find people to help me. Specifically I needed, at the very least, a webdesigner, somebody with writing skills to fill that website and somebody to print the maps. Fortunately I had all of those people in my existing network and while it sometimes was a laborious and frustrating process they all stepped in to help (for a price of course…). Especially the conversation with the copywriter was an eye opener, one of the first things she asked me was: “Who is your target audience” and I was like “Wow, that sounds like something I should have!”. I had never really considered that to be honest, who would buy these maps? I still am not sure but we eventually defined the target audience as people who love maps and/or typography and/or design and/or Amsterdam. A bit vague, I know. Getting the payment processing set up on the website turned out to be a bit of a headache too, the combination of various WordPress plugins was probably to blame for this, especially given my requirement for the whole site to be bi-lingual (Dutch and English). We got it working in the end though and can accept a wide range of forms of payments, cash on delivery is unfortunately, and ironically, not one of them but if you come to my office I’d be happy to take your cash in exchange for a poster. Getting the website set up did take more time than expected, partly because I wanted to do the bulk of the work myself. In retrospect I just should have told my web guy to build me a site (lessons learned…) and it did get to the point where I was getting a bit fed up with the setbacks (not the fault of my web guy I should add, it was just an unfortunate combination of factors. However, I can confidently state that producing the map and getting it printed was the easiest part of the whole project! It did highlight that in order to succesfully pull this off you either need to have many talents yourself or be able to call upon those who have the talents you don’t have. “Outsource the stuff you’re not good at” is an often-heard piece of advice for freelancers and I can heartily agree. All this is a big gamble for me. I jumped right in, started producing the map because I wanted to, because I enjoyed it. There is a risk of it not selling as well as I hope (or at all), if that’s the case then I’ll have 100 nice posters I can give away to friends. The whole project has cost me some money but it’s a manageable amount. It’s a risk I can take. Given the amount of fun I’ve had doing this map I decided to produce a few more. The whole framework for selling them is set up now so really production and printing, the easy bits, is all that’s left. The next one that I’m working on is Paris, although it’s just the 2 islands in the Seine, so no Eiffel Tower, after that I might do a world one. Another idea I’ve been playing around with is offering this as a promotional item. It’ll be easy to highlight a location anywhere within the center this map, think of a local business for example, or an event.